As we prepare for the holidays (only a month away!) we're dreaming of a White Christmas. 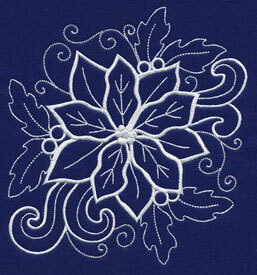 New designs are inspired by the classic whitework style. 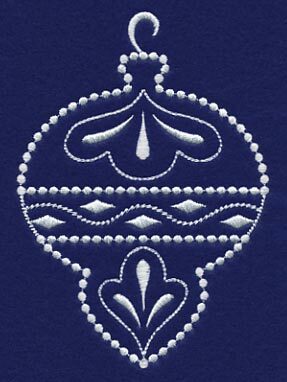 Traditionally whitework is stitched tone on tone, but we couldn't resist the eye-catching effect of white thread on midnight-blue fabric. 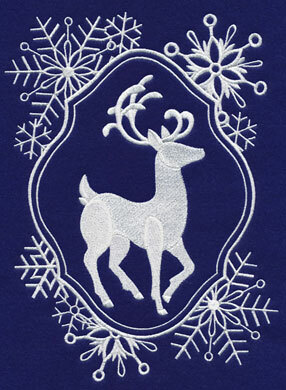 Below is a dramatic array of motifs that dress up gift-giving and holiday decor. 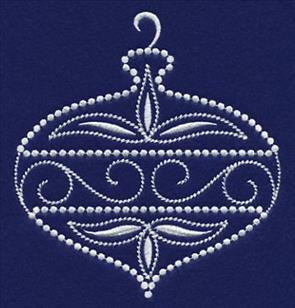 These designs are elegant, sophisticated, and a magnificent pairing of traditional imagery with contemporary flair. 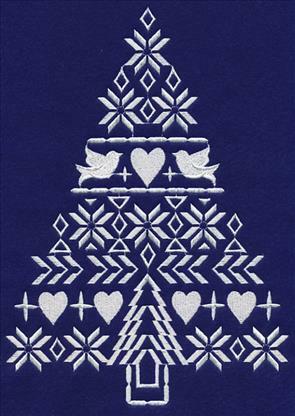 Scroll down the page to see these festive designs. 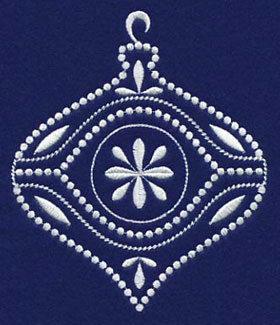 Embroider whitework designs onto velvet, and create timeless ornaments. Click here for the project instructions! Classic Christmas elements in festive frames add holiday cheer to your home. 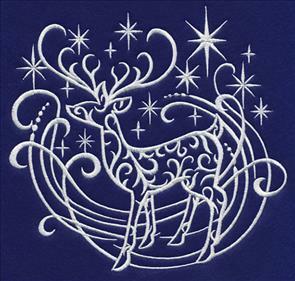 A graceful reindeer is ready to leap onto your stockings to add a magical effect. A blooming poinsettia can make a lively and lovely addition to aprons, tea towels, and table runners. 6.89" x 9.69" and 5.54" x 7.80" and 4.88" x 6.86"
Transform your home into a winter wonderland complete with these frosted forest designs. 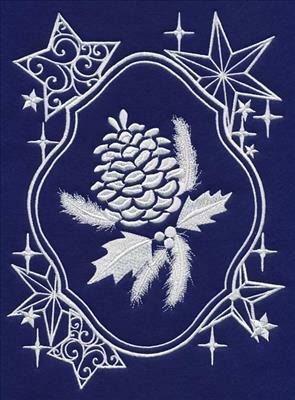 Friends and family will feel nice and cozy wrapped in a quilt decorated with this snow-covered pinecone. 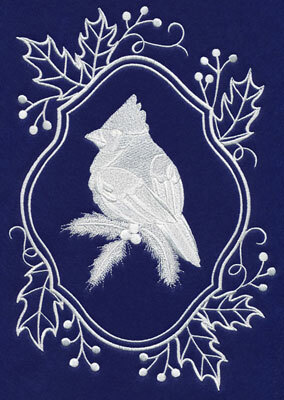 Or snuggle up close to the fire with a pillow adorned with this cardinal design. 6.89" x 9.78" and 5.49" x 7.79" and 4.84" x 6.86"
This dazzling Christmas tree adds a nice seasonal touch to any holiday gift. The stitch type and direction brings a feathery look to the branches, sure to add an elegant look to your winter decor. Ring in the holiday spirit with the clamor of bells! They'll add sweet melodies to pillows and tree skirts. 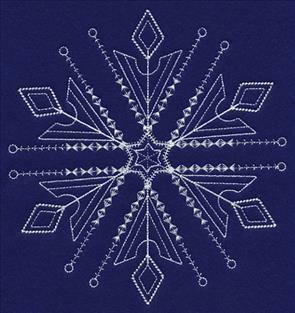 6.89" x 9.42" and 5.71" x 7.81" and 4.86" x 6.65"
Stitch a winter wonderland, and ring in the season with these beautiful designs! Choose singles with the links above, or buy all six in a design pack. Click on a link below to see the designs in the packs, and add it to your cart! 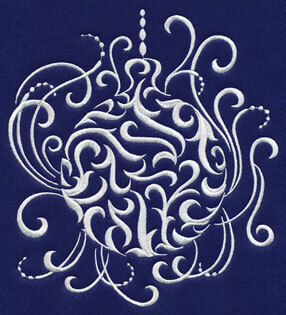 Eye-catching effects bring these Christmas designs alive. 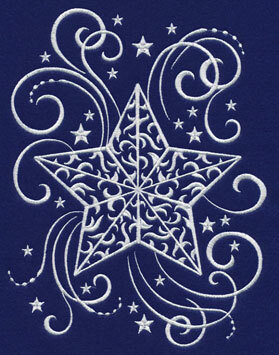 Swirls and stitching enhance a spectacular tree adorned with a mighty star. On the right, a poinsettia blooms with life. 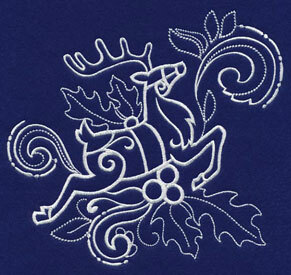 6.90" x 8.69" and 5.88" x 7.40" and 4.89" x 6.15"
These elegant ornament and reindeer motifs have stunning detail that perfectly ties in the spirit of the season. 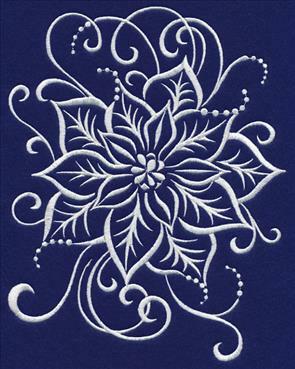 They have grace and energy, and filigree swirls make them timeless embellishments to placemats, wall hangings, and tree skirts. 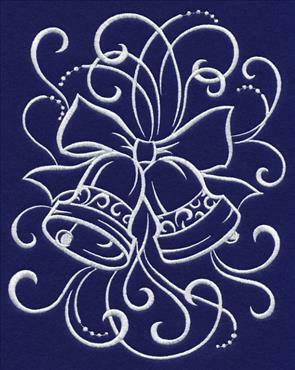 7.28" x 6.87" and 6.22" x 5.87" and 5.16" x 4.87"
One-color holly and holiday bells are framed by graceful filigree lines. It's time to deck the halls, and dress up stockings, quilts, towels and holiday linens! These beautiful designs will bring a holly and jolly spirit to your home this Christmas and winter season. 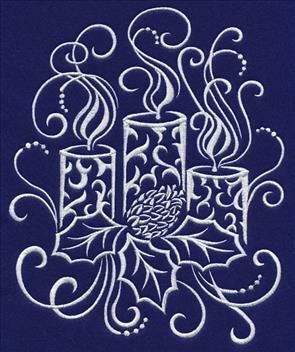 6.90" x 8.72" and 5.86" x 7.41" and 4.87" x 6.15"
Shine on this holiday season, and let your Christmas spirit fill the air with elegant whitework candles. Brighten up someone's day by giving them a tree skirt, apron, or quilt illuminated by the stunning star design shown below. 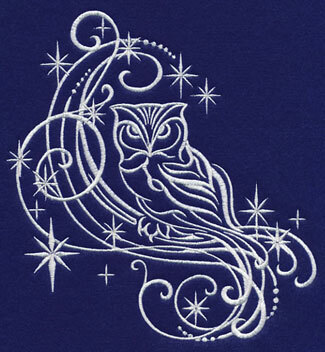 6.85" x 8.88" and 5.88" x 7.62" and 4.87" x 6.31"
Bring the beauty of the wintery woods to your home with this simple yet elegant one-color owl design. Elegance and energy of filigree swirls will leave you feeling merry and bright! 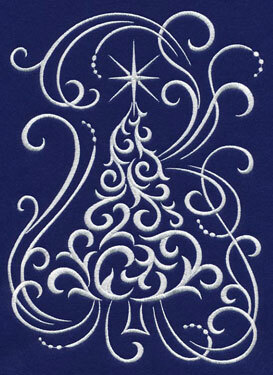 6.86" x 7.35" and 5.86" x 6.28" and 4.86" x 5.21"
Elegant filigree whirls and swirls add an artful and sophisticated look to your holiday projects. The designs above can be ordered singly, or get all 9 in a design pack! Click on a link below to see the pack contents, and add it to your cart! 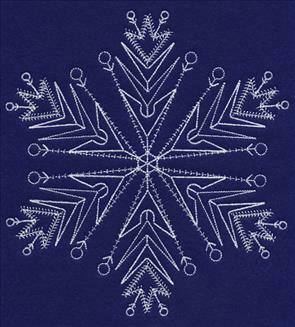 Add festive flair to holiday decor and garments with these designs. 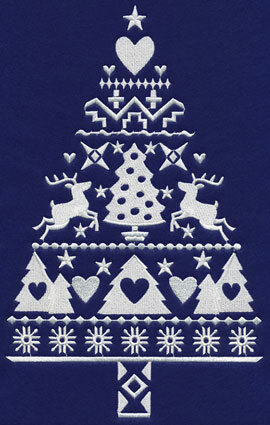 Inspired by classic Scandinavian sweater patterns, the designs are filled with traditional holiday elements. 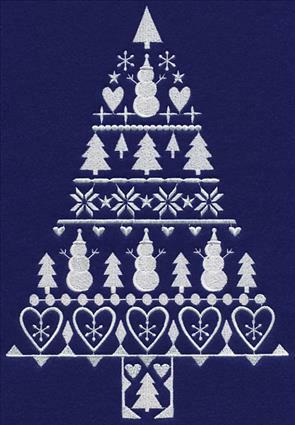 Look for leaping reindeer, hearts, and snowmen in the designs below. They're only one color each, and will bring the beauty of winter and Christmas to your stockings, table linens, quilts, and sweaters. 6.90" x 10.94" and 5.86" x 9.29"
6.90" x 9.97" and 5.85" x 8.44"
'Tis the season for peace and love! 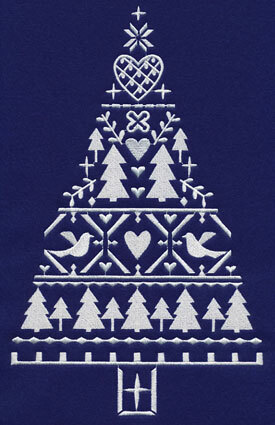 There's no better way to express those sentiments than with these Nordic tree designs, filled with doves and hearts. Pair them together to make a festive tree skirt or holiday table linens. 6.90" x 11.00" and 5.86" x 9.34"
6.90" x 9.50" and 5.67" x 7.80" and 4.86" x 6.69"
Let it snow, let it snow, let it snow! 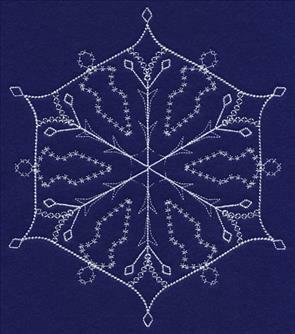 Bring the beauty of Winter's first snowfall to your home with these delicate whitework snowflakes. They're one color, with fine and delicate stitches. 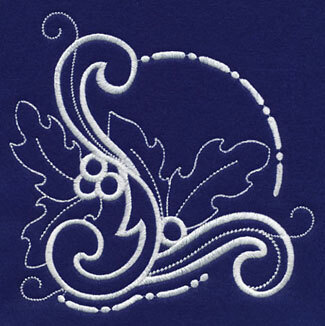 Embroider on smooth fabrics - such as quilter's cotton, tea towels, linen, silk, and satin - for excellent results. 6.85" x 7.77" and 5.85" x 6.63"
4.85" x 5.50" and 3.42" x 3.85"
6.92" x 7.42" and 5.87" x 6.29"
4.85" x 5.20" and 3.60" x 3.86"
These snowflakes are easy to use, and one-color thread designs. Sprinkle them onto wine bottle bags, tree skirts, and wall hangings, adding the perfect touch of winter elegance. 6.82" x 7.83" and 5.85" x 6.72"
4.84" x 5.55" and 3.36" x 3.85"
6.85" x 7.19" and 5.85" x 6.14"
4.90" x 5.15" and 3.65" x 3.84"
These snowflakes are light and open, and will work beautifully on smooth fabrics. 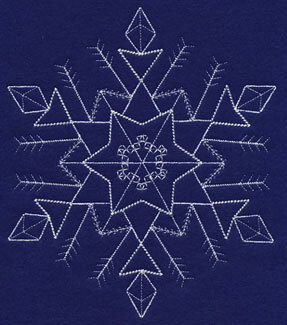 Their magnificent details mimic those of real snowflakes and will have your guests doing double-takes. 6.83" x 7.83" and 5.85" x 6.70"
4.86" x 5.56" and 3.37" x 3.85"
6.82" x 7.83" and 5.86" x 6.72"
4.86" x 5.58" and 3.39" x 3.86"
Elegant and delicate snowflakes let you bring the beauty of winter to quilts, tea towels, table linens, and more. 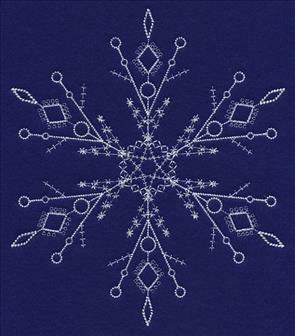 Order the designs individually by using the links above, or get all 6 snowflakes in a design pack! Click on a link below and add it to your cart! 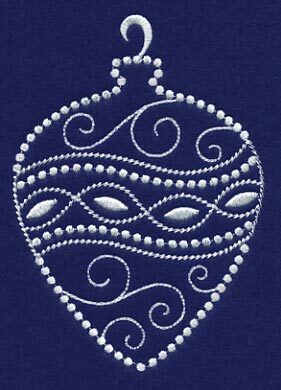 **Md - Designs smaller than 4" x 4"
Add graceful artistry to holiday gifts and decor with these festive one-color ornament designs. They're quick to stitch, but filled with Christmas charm and cheer. Use them to dress up holiday decor, apparel, and gifts that need an extra splash of Christmas spirit. 2.81" x 5.02" and 2.17" x 3.87"
Festive ornaments are a beautiful way to celebrate the season. 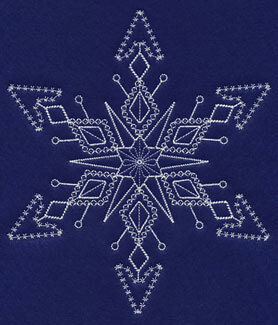 Embroider these designs to dress up placemats, tea towels, aprons, and winter-themed wall hangings. 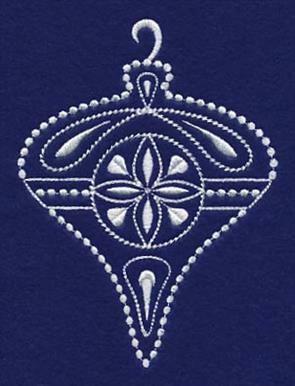 3.58" x 5.01" and 2.75" x 3.84"
Stitch sweet and seasonal details onto your Christmas decor. 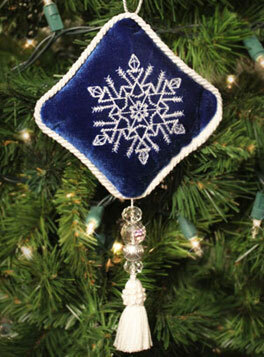 These ornaments are a classic embellishment to pillows and tree skirts. 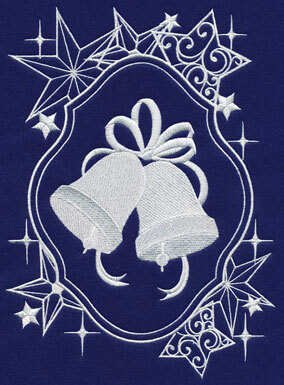 Their one-color thread makes for quick-stitching whitework that looks lovely on smooth fabric. 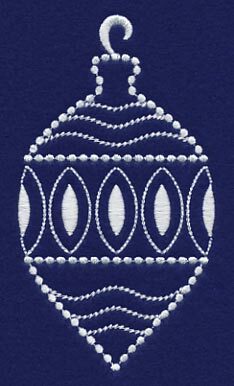 4.29" x 4.99" and 3.32" x 3.85"
One-color ornaments are quick to stitch accents on denim stockings, placemats, quilt blocks, and twill gift bags. Order the designs individually by using the links above, or get all 6 ornaments in a design pack! 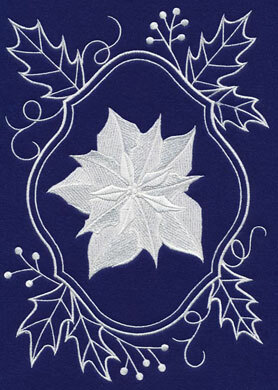 These designs, inspired by classic whitework, feature a traditional holiday image on a backdrop of stylized holly and leaves. Light and lovely on table linens and tree skirts! One of Santa's reindeer has wandered from the North Pole and can't wait to be the newest addition to your holiday decor. The poinsettia will be an eye-catching addition to tea towels or table linens. 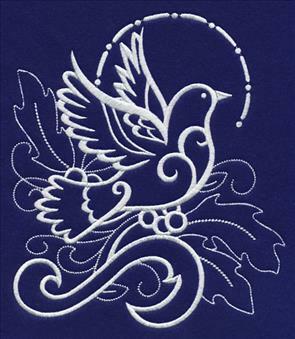 6.91" x 7.50" and 5.89" x 6.39" and 4.86" x 5.27"
Bring the peace and happiness of Christmas to your home with this one-color dove design. Stitch it onto tree skirts, placemats, and tea towels to perfectly tie in the spirit of the season. 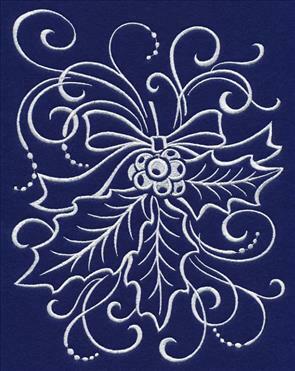 6.90" x 7.62" and 5.86" x 6.47" and 4.83" x 5.33"
A trio of holly leaves and berries is a festive addition to table linens. Repeat it on tablecloths, placemats, and table runners. Pair it with the coordinating corner on a napkin for gorgeous dining decor. 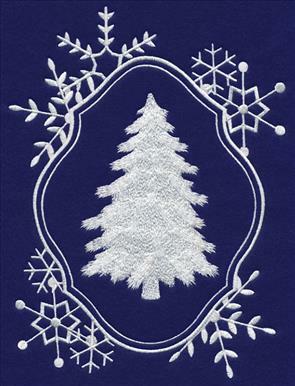 11.75" x 4.42" and 9.41" x 3.54" and 7.80" x 2.94" and 6.00" x 2.45" and 3.86" x 1.89"
Embroider this lovely holly corner onto linen napkins, pockets, and the corners of placemats. It will bring a light and cheerful effect to your garments and decor! 6.01" x 5.89" and 4.98" x 4.89" and 3.89" x 3.81"